Right panel of a triptych (99.111.3-.5). 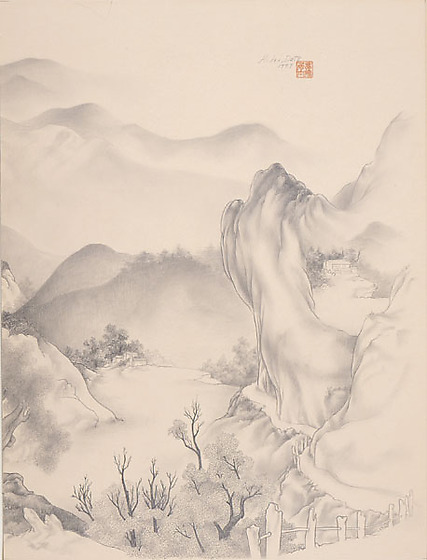 Landscape drawing of mountains. In foreground, branches with leaves appear next to a fence lined path that winds around cliff on right; a dwelling appears in the valley sheltered by cliff to the right. Three small structures appear at midground next to trees and a mountain rising on the left. 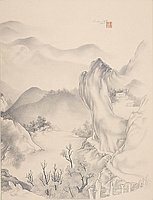 Mountains rise behind them and appear in the distance. Influenced by Nihonga and Chinese painting.